On the server, absolute block signals seem completely broken. Something in last nightly has totally broken them. On the server all lines operating with them have stopped working. I am attempting to restart my company lines in case it was a once off save/load cycle bug with the new nightly. So far symptoms include multiple convoys in same block, signals not working to reserve blocks ahead, platform choose signals ignoring full platforms, etc. When changing schedule some reservation tiles are also not being removed. First signs show that absolute block is ignoring block mechanic, allowing all trains to move through it at full speed in a drive by sight fashion within the same blocks. All lines effected only use absolute block signals. If you need an example on the server game look around, my company was not the only one effected. Estimated cost per month of server game to my company alone is at ~450k or more since I just upgraded most of my lines from the buggy time interval signals. Many of the smaller companies will likely be insolvent by the end of today unless people stop playing on the server until this is fixed and they are back to fix it. I can confirm something is broken with the logic of absolute block signals. It appears blocks are no longer being reserved, allowing many trains to enter the same logical block which should be impossible in an absolute block signalling system. These will create an unnatural reservation. 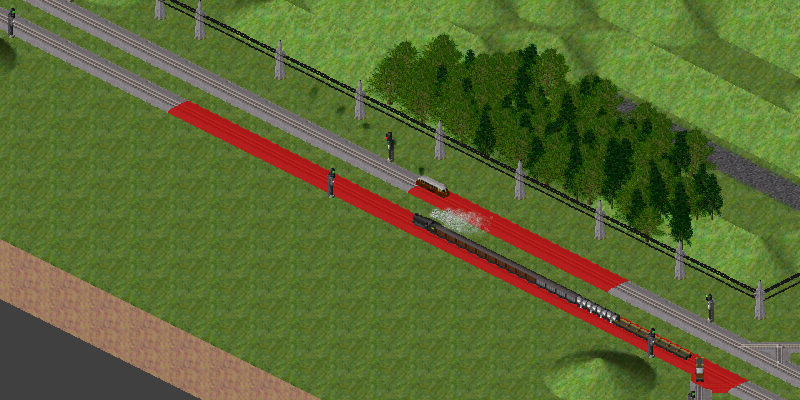 For example, reservation is cutted off in 2 tiles front side of the signal or reserves like drive by sight. This picture is the state of track circuit block in demo.sve. Thank you for the reports: I have merged nochiu's report which appears to be relating to the same issue. I believe that I have now fixed this error, and am about to reset the server manually to upgrade to this newer version forthwith, although the process will take ~15 minutes to complete. Except if the server's been running if someone was on, like all companies save arlpike person will be bankrupt. Unless you have a backup save. Not all companies. At the rate of money loss it would have taken around 500 years for mine to go bankrupt, unless refunds started ramping up. Seems fixed now. I restarted all my lines then left. I recommend others do so ASAP.